The type and size (cfm) carb you should be running on your engine will vary depending on numerous factors. Let me begin by saying this first; about 90% of the so called "hot rods" out there have carbs that are WAY too big. More carburetion does NOT mean more power. In fact, what it really means is less torque, less get-up and go, and less acceleration off the line and at low to mid RPMs, which is where most races are won... and lost. First off, you have to consider how a carb works. It's a simple design with several transition "circuits", from the idle circuit, the transition slot, the accelerator pump circuit, the power valve circuit, to the main jet circuit. Then there are other "helper" circuits such as the low speed air bleeds and the the high speed air bleeds, the emulsifier wells, etc. When an engine is idling, you are on the idle circuit. As soon as you give it the gas, the throttle plates open and the engine (being nothing more than an air pump) takes a gulp of air. Well, your engine doesn't run on air because air doesn't burn, so you have to add a quick shot of fuel with that air so the engine will respond and not fall on its face. The accelerator pump squirts a metered shot of fuel along with that initial gulp of air to get that engine to respond and begin to accelerate. In literally just about 1 second of time, the accelerator pump shot stops and the increasing air flow going through the barrels / over the boosters begins to "siphon" fuel through the main jets maintaining a metered amount of fuel along with that steady incoming air flow. The "size of the air pump" (your engine cid) determines the velocity and volume of air going through a given size of carb. A smaller carb will respond quicker because the air speed is going through it faster than what a larger carb would have going through it. Think of it like this; your lungs are your body's air pump. Grab a typical soda straw and blow through it hard. The air coming out the straw is fast and powerful. Now grab a piece of 3/4" heater hose and cut it to the same length as the straw and blow through it as hard as you can. The air speed coming out the other end isn't nearly as fast or as "feelable" with your hand as it was with the smaller straw. Now imaging doing this with a 2" piece of radiator hose. You would probably feel almost no air velocity coming out the other side at all because that hose is so big compared to your air pump (lungs). You would need a bigger set of lungs with much more capacity to get better air flow and speed through that 3/4" heater hose, and even more yet to get any kind of velocity going through that 2" radiator hose. Well, engines are no different. They are nothing but an air pump like your lungs. That air pump pulling through a small carb is going to have a MUCH higher velocity going through it than one that is too big, which means it reacts quick. Low velocity means the carb can't react and "give" fuel to the engine very quick to meet the amount of air it is trying to take-in at any given time. This is why guys with too big of carbs need to "feather the throttle" at low RPMs to get their car going and then say: "Yeah, but once I get going, it REALLY goes!". Yeah, because at lower RPMs your engine isn't pumping much air so that big carb can't react UNTIL you get going and your RPMs start coming up! You nail the throttle and the engine takes a gulp of air but can't get the fuel to maintain the air/fuel ratio to make it accelerate, so what do you have to do? Feather the throttle (open and close it) to help "create" more velocity to make it react and to get that accelerator pump to squirt fuel to meet all of that air the engine wants to take-in but can;t get the fuel with it. Once you get the RPMs up, the engine is pumping enough air volume to create enough velocity to finally make the boosters react and feed fuel to the engine. In the mean time; a guy with a properly sized carb can nail his throttle and accelerate off the line leaving you and your sluggish carb 3, 4 or 5 car lengths behind. Well, in a stop light to stop light race... you just got your doors blown off! It's also why a lot of guys can either not do, or maintain a good burnout, because the carb is simply way too big to get the engine to react to break the tires loose and maintain that burnout all the way down the block. As soon as the engine starts to see that load, the air speed (velocity) slows down and the carb fails to deliver an ample amount of fuel to make any power, so it bogs down and you look like a fool with a turd of a car in front of all of your friends. This gets even worse with multiple carbs! Two 4's are bad enough, but an 8 stack Weber system is the worst! Now, obviously "race cars" use big carbs (even two big carbs sometimes) and accelerate great, but you have to remember a few things; Real race cars run really low gears, such as 4.56's or lower to get that engine TO it's peak power making RPM as quickly as possible. They also run high stall converters, again to get that engine INTO it's best torque making RPM to launch as hard as possible, which is sometimes at upwards of 5,000 RPM or more. How many times are you running at, or above 5,000 RPM or more on the street under normal driving conditions? How many stop lights do you, (or even CAN you) launch your car at? Without a 4,500 - 5,000 RPM stall converter, you won't be able TO launch at that RPM, where a real "race engine" launches at. You certainly don't see any race cars at the track taking-off at just above an idle, or running down the track at less than their peak power making RPM, which is usually between 6,000 and 8,000 RPM, so why would anyone consider running the same size carbs those types of engines and cars run on their street car? It's dumb is what it is, yet a LOT of guys do it and then wonder why a mom with her 4 kids in a V8 Mercedes or BMW SUV can blow their doors off and not even know you were trying to "race" them. You have to consider that even NASCARs with their 356 cubic inch engines run 750 carbs and sustain 9,000 RPMs making 800+ HP (before they went EFI), so are all of those guys that are over carbbed trying to tell me that their engine needs to, or are even capable of, running at 9,000+ RPM and make 800+ HP? Hardly! So if a 750 carb is "big enough" to support an 800+ HP, 9,000 RPM engine, why is that same size carb on engines making HALF of that power and running at half that RPM? Again, it's because most guys over carb their engines, and to compound the problem and make it even worse, run rear-end gearing that is WAY too tall, have stall converters that are way too low, and cams that are way too big and lumpy, because they want that "race car sound", and then wonder why mom and her 4 kids in that stock V8 (a SMALL V8 at that) can out run them on any given day. It's because that SUV was DESIGNED so everything works TOGETHER, where most guys with "hot rods" don't "design" anything into their car, and instead, just run what either everyone else that runs slow is running, or they run what they see guys at the track running without taking into consideration a couple of VERY important factors; 1) Race cars at the track don't dive like you do on the street, and 2) Race cars at the track have other things besides the engine to help them accelerate and go, such as gearing, the high stall converter, and what RPM they NEED to run at compared to what your street car runs at 90% of the time. So, what size carb SHOULD you be running on your engine? The chart on the right will enlarge when you put the cursor over it and will show you, by physic mathematics, what size carb is required for an engine running at the PEAK RPM shown at the top. keep in mind, this is PEAK RPM, not "sustained" RPM, and it doesn't take into consideration things like gearing and stall converters. Obviously if you have a hot little 350 engine in your car and that car is lightened-up a bit and has something like 4.11's in the back and a 4,000 RPM stall converter, you'll be able to get away with running a larger carb than someone with a heavy car, tall gearing and not much of a stall converter to get that engine moving, so even with physics and math, nothing is absolute or static, so use the chart as a "guide" and again, keep in mind you are using a PEAK RPM number to base this carb size by, so in MOST CASES, a slightly smaller carb that what your peak RPM is will be a better, all around performing carb than one that is on the big side. Just remember; a smaller carb = quicker throttle response and lower RPM acceleration. A bigger carb means nothing more than better TOP-END acceleration. On a carb that is too big, everything below that peak operating RPM WILL suffer, meaning; your so called "Jack Rabbit" starts will be more like slow turtle starts. Your throttle response will be sluggish. Your gas mileage will such because at lower RPMs you'll be feathering the throttle more and more to meet that sluggish velocity with fuel needed from the accelerator pump rather than the main jets where it's supposed to be coming from. If you have to choose between two sizes of carbs, in MOST cases on the street (or even at the track sometimes), you'll be happier with the smaller carb. 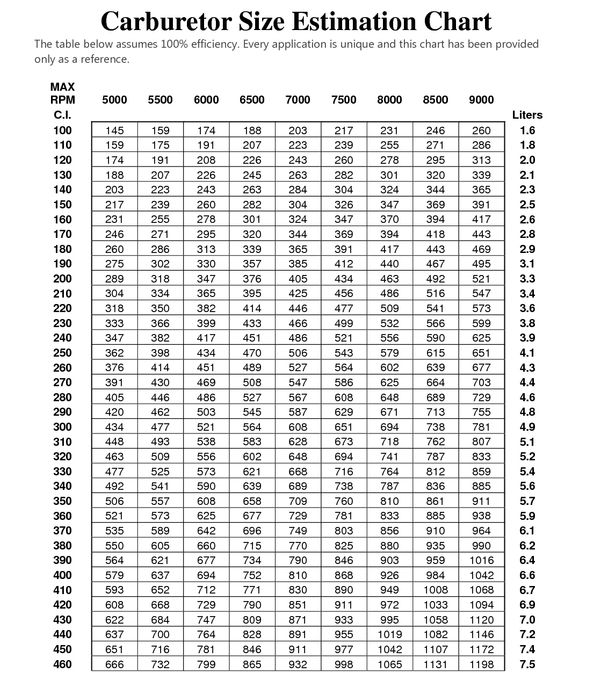 So looking at the chart and taking something simple as a base line engine, such as a 350, you can see that a 600 cfm carb would be best for an engine who sees a PEAK RPM of 6,000 and that a 550 or even a 500 cfm would be even better yet for something that isn't seeing that 6,000 RPM range much. keep in mind, MOST flat tappet cams and even most hydraulic roller cams peak out at about 5,500 - 6,000 RPM, including what many would consider being fairly "healthy" cams that have between 225 and 240 degrees of duration @ .050", so even a so called "healthy" cam in "most" typical 350 sized engines will peter-out at, or around, 6,000 RPM, so why would you want to stuff a 750, 800 or an 850 carb on something that simply cannot utilize it, and doesn't NEED it? Unless of course you LIKE having to feather the throttle and have a turd of a car with mom and her 4 kids waiving at you from their SUV as they pull away from you from the stop light or getting on the freeway. If you want to learn more about this kind of stuff, in much greater detail, be sure to check out my Auto Shop Videos series by clicking HERE. I have one titled "Performance Carburetors" that covers all of this kind of stuff and MUCH more. These make great Christmas and Birthday gifts as well.